John Hood: I'd rather help the needy than make money for the greedy. Very enjoyable and a feel good movie, a lot of fun, this should have been the next Saturday night fever or Rocky horror. 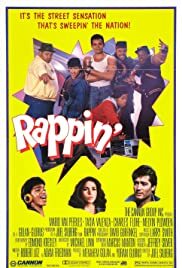 This film is dull early on but really gets going from the quarter way stage, and it tries to show the underrated Mario Van Peebles as a kind of Robin Hood figure (he is called John "rappin" hood), out of jail and trying to re-discover himself and save his neighbourhood from a greedy property developer and save his brother from a life of crime and jail like his former self. Everyone is infuenced by the power of rap and all become better people for the experience (yes very cheesy) this is for sale on region 1 (where I purchased) but not in the UK where I live, the wonders of internet, credit cards and multi region players, even a happy ending for me :-) get this film, buy it and tell all your friends about it, it deserved to be a cult classic.